Madera is a geometric sans serif typeface created by Malou Verlomme and published by Monotype which is available in 16 styles, 8 weights (from Hairline to XBold) and italics, each font has over 650 glyphs, a wide range of OpenType features (some alternates, circled figures, diverse arrowa, some ordinals, old style figgures, super & sub script, tabular figures etc.). Also it has language support. This versatile font is ideal for typographic use, branding, print etc. Enjoy! 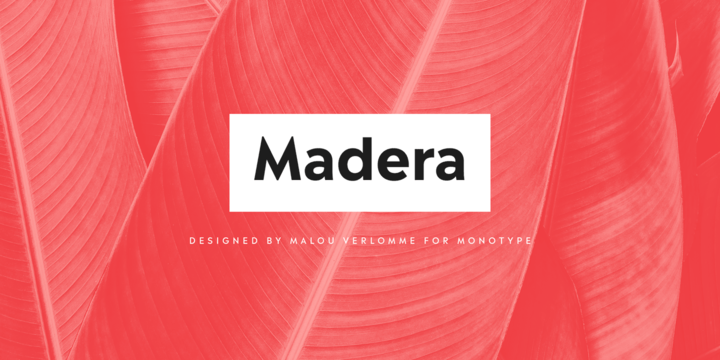 Note: “Madera” is a trademark of Monotype Imaging Inc. and may be registered in certain jurisdictions. Price: starting from $49 for one font to $199 for all 16 fonts. A font description published on Monday, March 19th, 2018 in Fonts, Malou Verlomme, Monotype by Alexandra that has 3,000 views.